As a traveler, you always have a few things on your bucketlist that NEED to be done. These could be destinations, but also experiences. 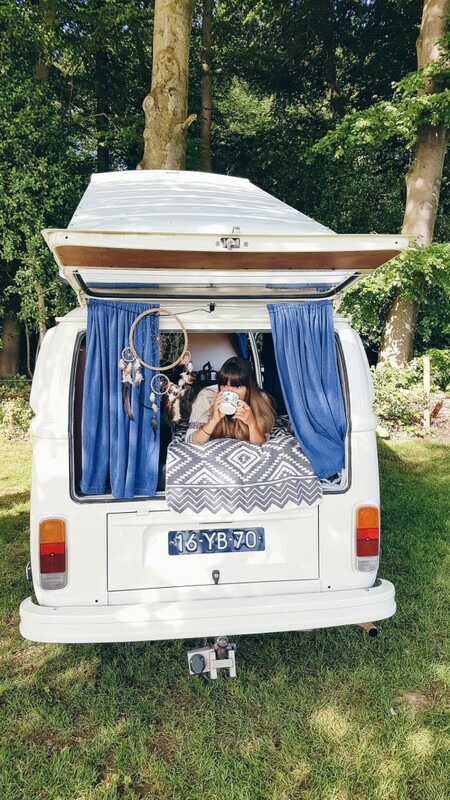 Most people would agree if I said that taking a roadtrip with an old Volkswagen Van would be one of them. I certainly had it on my list and 2 weeks ago I was so lucky to cross it off my bucketlist! 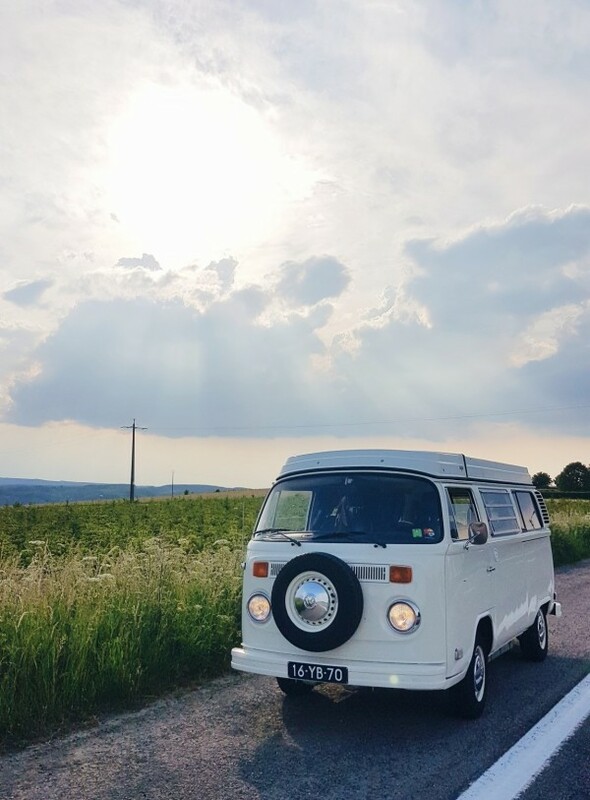 Camptoo, the Airbnb for campers and mobile homes, asked me to take an oldtimer Volkswagen T2 for a little roadtrip. 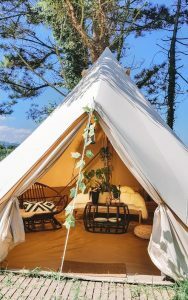 It’s too easy to compare Camptoo with Airbnb but it’s really the best comparison to make. It basicely works like this; most mobile-home owners only use their ride half the time so it just sits there, in front of their garage. 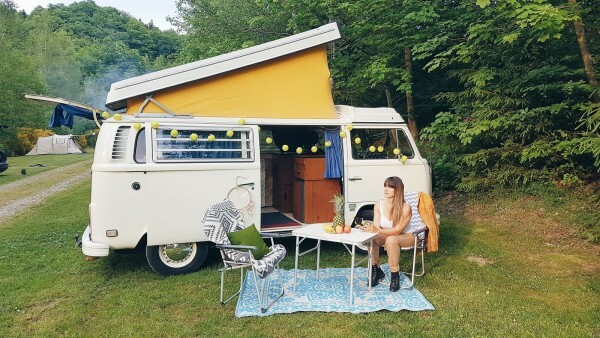 Camptoo makes it possible for those owners, to rent out their camper. Just look on their website and select the camper you want, for how long and which date. You get several options and all you need to do is to pick your favorite and send the owner a message. You will see if it’s available and if they accept your request. After a quick check up, we were handed over the keys and headed on our little adventure. Once accepted you will receive a confirmation email plus a text message. I picked the beautiful (and in a very good state!) 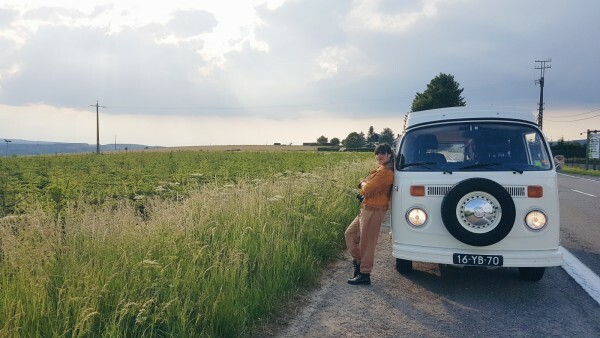 Volkswagen T2 Van owned by Nicole from Limburg. Not really knowing what to expect, me and my family drove down to her house where Nicole explained everything we needed to know about her precious ride. Camptoo makes sure that you are all-risk insured and you pay a deposit to cover yourself for any damages along the way. Just make sure to have your travel insurance sorted. After a quick check up on damages and details, we were handed over the keys and headed on our little adventure. I have a baby of 3,5 months old so I was a little nervous about sleeping in a van of course. What about the cold? Would the rain come inside? What if the van breaks down? All the motherly instincts you would expect, but as a true traveler, I needed to let some of these insecurities go and enjoy the ride. Literally. The first thing I noticed is that driving a car like this get’s a lot of attention. A lot. People waving, throwing up peace signs or giving you a thumbs up out of respect. Pretty cool. We decided to drive to The Ardennes, an area with hills and greenery and lot’s of adventurous roads. 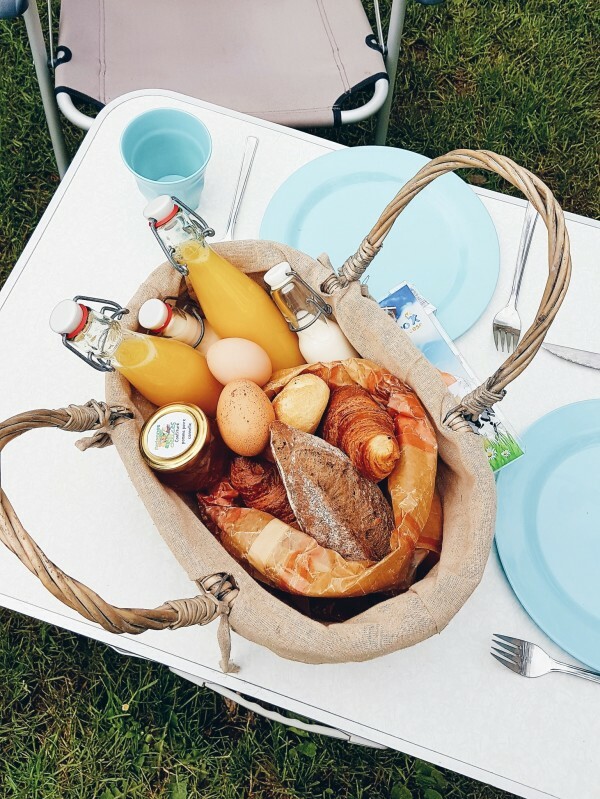 From Limburg we had about 2 more hours to go and we found this amazing camping online called Les Cabanes De Rensiwez. 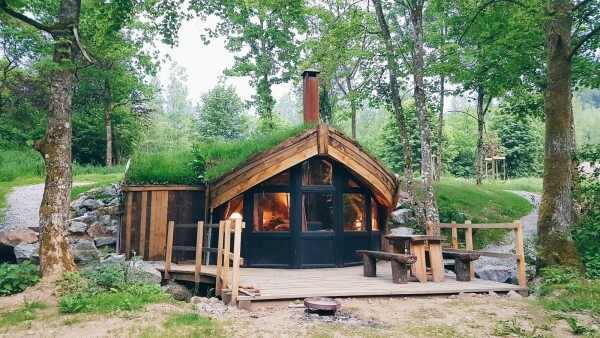 Here you can camp but also rent the most amazing lodges such as treehouses, Norwegian style cabins and hobbit-like-houses. Our campervan included a little kitchen with a stove so we could prepare dinner and make some tea. Very handy if you need to warm up! No camping adventure is complete without a little thunder storm and boy did we have one on the first night! It rained and rumbled for about 3 hours but it just made the whole experience even more special and cozy. TIP: Bring your own pillows for comfort and a (extra) warm sleeping bag as it get’s very cold at night even during summer. Many camper owners have blankets available but they can be too thin for your liking. Yep, this is soo me! The next we drove down to a special place called the Jan Foppen Forest. This is a small forest on top of a hill where you can do crazy survival stuff like abseiling, climbing, paragliding, horse riding and more. My boyfriend and his parents used to come here and group of friends book a weekend here to spend quality time. We just came to say hello and show off our amazing campervan of course ;-). 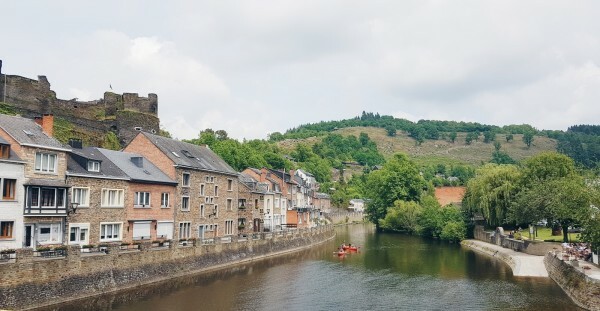 It’s definitely worth checking out if you’re heading to the Ardennes. Check here for more info. On our last and final day we really got to drive through small towns where we stopped if we saw something nice such as a little Sunday market or a beautiful viewing point. We had to deliver the Van back to it’s owner in the early afternoon so we decided to sleep at a camping in Limburg, near the Belgian border. This camping was very modern and even had a swimming pool, restaurant and beautiful forest nearby to walk in. A dream come true. honestly. Okok, I didn’t have a lot of sleep like I would have in a 5 star hotel but that’s not what camping is about. 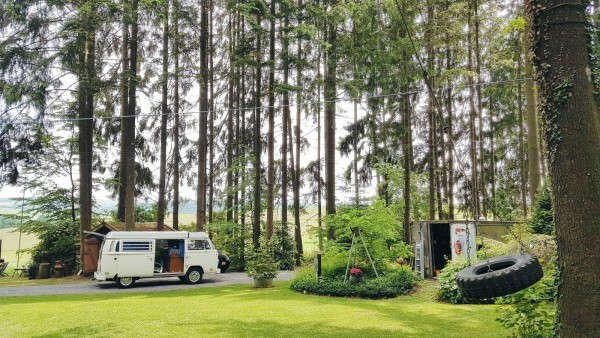 Camping and especially, camping in an oldtimer, is about the magic of it. The adventure without knowing where you will sleep the next day and to follow your own path. I’m so glad I did this as a family so I can tell my son about our little adventure when he’s older. I felt like a true nomad and how amazing that he was a part of it. Besides that, the whole thing was so well organized from beginning to the end. Do you want to go on the same adventure? You can find the Volkswagen Van that I traveled in, here: camper/2553. Thinking about renting out your mobile home? Visit Camptoo’s website and check their Facebook & Instagram for inspiration! Check out my video to get a good impression!